It started out a bit rough as two researchers from FIU told Miami Beach City Commissioners that they were just in the beginning stages of their analysis on the economic impact of a rollback in hours for the outdoor service of alcohol on Ocean Drive despite a referendum on the matter in a few weeks. In the shadow of a study sponsored by the Florida Restaurant and Lodging Association forecasting a dramatic negative impact if the measure passes, they are on the hot seat to deliver another view in a very short time period. City Manager Jimmy Morales noted the reason for the late start was because outreach to traditional consultants with experience in this type of analysis was unsuccessful due to various conflicts. The FIU team was retained about a month ago, they said. Dr. Ned Murray, Associate Director of the Metropolitan Center at FIU, said the team is working through City data and an analysis of a community survey of residents of Miami Dade County as well as an analysis of user generated reviews from national and international tourists. While they’ve done some economic analysis and will ultimately provide their own economic impact modeling, he told Commissioners this week they weren’t ready to present any findings, even though the November 7th vote on the question is just a few weeks away. Murray did share some highlights of the community survey of 400 County residents. He said, “25% or so come here at least once a month, others less frequently.” When asked their main reason for not visiting more often, 26% cited difficulty of traffic and access time. The other category that came in at 25%, he said, was “the combination of distance, geography, and the fact that there are other venues around the County” to frequent. The initial analysis of user generated content going back two years from Trip Advisor and Yelp consisted of more than 3,300 reviews, with international tourists contributing about one third of reviews and tourists from the United States, the other two thirds. He noted 88% of the reviews were from commenters outside of Florida. In totality of experience, Murray said 68% of the reviews were positive, 25% negative, and 7% of the reviews contained both positive and negative comments. “You can see the good news for Miami Beach is that nearly 70% were positive reviews of their visits here to Miami Beach,” Murray said. He acknowledged, “There are going to be significant losses of income. 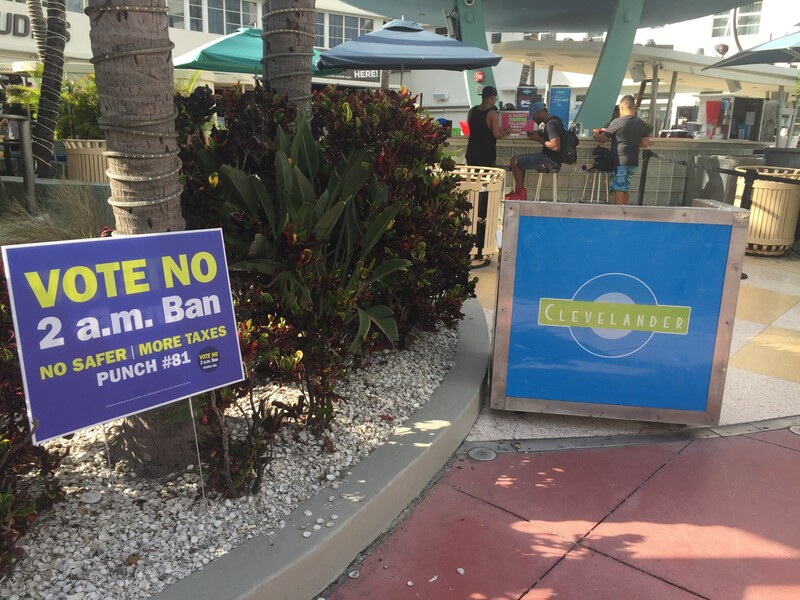 The Clevelander and Mango’s are the two top sellers of alcohol in Miami Beach. Between them it’s $38m in alcohol sales a year. That’s significant. Those are large businesses by Miami Dade standards. They may lose someplace between 15 and 20% of sales revenues based on that. However connecting those sale losses … to the loss of one million hotel room nights, we’re just not getting it. We’re not getting it. If there is a loss in hotel room nights – we’re not sure that there may be because of the simple fact that you have a wide variety of choice” of other places to go when the eight bars would close at 2. Rather than a survey of the operators, which is what Fishkind conducted, the FIU researchers said they are using City tax records for their analysis. Levine said even if the researchers could simply give ranges, getting comparative numbers sooner is important. Morales said FIU planned to deliver numbers by October 31st, but Murray and Greiner said they would try to get them sooner. Commissioner John Alemán asked the researchers to explore both their assumption that visitors will still come and simply go somewhere else when one bar closes at 2 and the other side which is the concern that she’s heard that they “just might not come” because they don’t want to go through the hassle of going somewhere else. Levine said he was looking forward to the final report and comparative numbers. “We’d like to know how much of Fishkind’s fiction is real,” he said.